Gili Island Fast Boats – Marina Srikandi is one of the biggest operator which offer fast transfer Bali to Gili Islands, Bali to Lombok and Bali to Banyuwangi. Marina Srikandi Fast Boat depart from Padangbai harbor till the end of 2015 and then change departure point via Serangan harbor. Marina Srikandi grows as the biggest fast boat operator fastly, supported with new boats and professional staff. Bellow is some boat that still operated by Marina Srikandi. Marina Srikandi 1 and 2 have been around in operation since December 2010,provide spacious and cozy interiors and are still in great condition due to our professional maintenance teams. 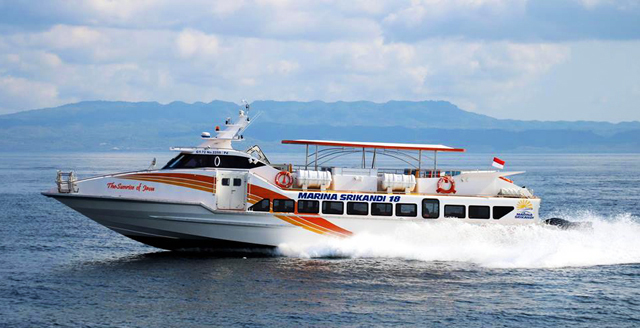 Marina Srikandi 8 began service in December 2012 and at time it was largest and the majority of luxurious fast boat in Bali complete with air conditioning, LCD TV and stereo system. MS8’s title only agreed to be taken by our newest boat, Marina Srikandi 11, which arrived in September 2013. Marina Srikandi 11 continues to be premier fast boat operating in Bali with two decks, air conditioning, LCD TV, stereo system, spacious seating, elegantly designed interior plus a VIP room about the bridge. Then manufactured in our personal shipyard, Marina Srikandi 12, Marina Srikandi 16, Marina Srikandi 17 and the latest Marina Srikandi 18 which can be specifically designed for disabilities. Life rafts whose capacity is greater than the number of passengers on boards and which can deployed via hydrostatic (on contact with water) or manual release. EPIRB: Emergency Position Indicating Radio Beacon. Upon contact with water the EPIRB automatically sends an SOS signal via satellite, informing authorities of the vessel’s name and precise location. EPIRB continue to signal for up to three days. Full set of distress flares. 3 to 5 Emergency Exit doors. At left and right of the boat and the back door. After landing at Gili Islands, the boat continue transfer to Lombok, stop at Teluk Nara harbor. The boat overnight at Teluk Nara and used for the morning transfer to Bali. Fast Boat from Lombok to Bali departed at 08.00 and 11.00am. This newest route that offered by Marina Srikandi, fast transfer from Donganan Bali to Banyuwangi. We recommend to use this transfer for the visitor who will spend holiday in Banyuwangi such Baluran, Red Island, Ijen and much more.